The Normal birth research conference is an annual, international event that takes place to focus on less complicated aspects of pregnancy and birth. This year it took place in the beautiful surroundings of Grange-over-sands overlooking Morecambe bay and on the edge of the Lake District. On this occasion there were delegates from over 20 countries including Canada, USA, New Zealand, Australia, Brazil, Poland, Spain, the Netherlands, Sweden, Norway and India! The attendees included midwives, obstetricians, birth supporters, architects, artists, geographers and educators as well as representatives of the World Health organisation, charities and Baroness Cumberlege from the UK House of Lords. Research at Bournemouth University was well represented from CMMPH, CQR and CEL. Midwifery lecturer, Sara stride, on behalf of the research team of Professor Vanora Hundley and Dr Sue Way, presented a poster of their work, ‘a qualitative study to explore UK midwives’ individual practice, beliefs and attitudes regarding perineal care at the time of birth’. Dr Jane Fry, also from the midwifery team, presented a research topic on her Doctoral work, ‘ A descriptive phenomenological study of independent midwives’ use of intuition as an authoritative form of knowledge during women’s labours and births’. She also facilitated a workshop titled ‘ Finding your own intuition: a workshop designed to explore practitioners’ ways of knowing during childbirth’ . 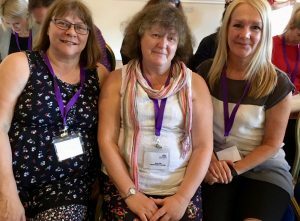 Dr Jenny Hall presented a research topic based on recent research with Dr Bethan Collins from Liverpool University, Professor Vanora Hundley and Jilly Ireland, midwife and visiting researcher, ‘How can we improve the ‘normal’ childbirth experience of disabled women?’. She also facilitated a workshop with a colleague from RGU, Aberdeen, Professor Susan Crowther, ‘Spirituality and childbirth: bringing a felt-sense into childbirth- a co-operative inquiry’. 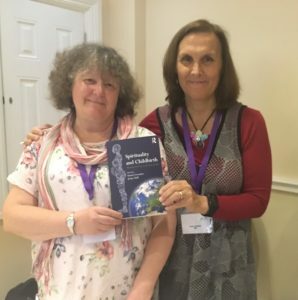 In addition, her new internationally authored book jointly edited with Professor Crowther, ‘Spirituality and Childbirth: Meaning and care at the start of life’, was officially launched at the conference. The impression taken away was the passion and importance of more evidence required around more ‘normal’ aspects of pregnancy and birth, especially in countries with less resources. There is considerable humanising of care being carried out internationally, and is a key focus at the World health organisation. A focus for the UK midwifery is current maternity services transformation, yet much of the global focus is on the importance of transformation in line with the recent Lancet series on maternity, and international collaboration to achieve the goals for Sustainable development. As a force, the team behind normal birth research serve this area powerfully, in informing care for women, babies and families across the global arena. The final rousing talk by Australian professor Hannah Dahlen, to the current backlash to ‘normal birth’ in the media was inspiring and is an editorial in the international journal Women and Birth. Next year the conference is in Michigan, USA!